Super Moisturizer Avocado Oil Foaming Bath instantly hydrates skin. Long-lasting bubbles that gently cleanse. Dr. Teal's Super Moisturizing Foaming Bath transforms an ordinary bath into a relaxing spa. Usage: Pour a generous amount of Dr. Teal's Foaming Bath under warm, running water for a relaxing bubble bath experience. Ingredients: Water, cocamidopropyl betaine, sodium lauryl sulfate, glycerin, sodium laureth sulfate, fragrance, persea gratissima (avocado) oil, zinc PCA, PEG-4 rapeseedamide, sodium chloride, citric acid, PEG/PPG-18/18 Dimethicone, sodium hydroxide, disodium EDTA, methylchloroisothiazolinone, methylisothiazolinone, citrus aurantium duclis (orange) peel oil. Caution: For external use only. Use only as directed. Excessive use or prolonged exposure may cause irritation to skin and urinary tract. Discontinue if rash, redness or itching occurs. Consult a physician if irritation persists. Keep out of reach of children. 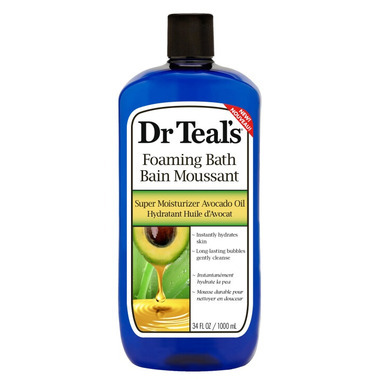 Got a gold star for getting this for my wife... she LOVES it, as she does all Dr, Teals Bath products.